Thanks for helping me out with this issue. When they deceided to build a new convention center downtown should have planned to then buy the IX Center as the site for a new terminal. Pittsburgh already rebuilt most of airport on the same site in the 1970’s. The congestion at the terminal will never be solved till the terminal is moved. Apparently there are several billboards around town with Aer Lingus and Failte Cleveland (Welcome Cleveland) on them. Could this be a tease for new CLE-DUB service? The signs look kind of amateurish and don't have the EI logo or typeface. However, I see on other boards rumors that CLE will offer waived landing fees and advertising support for the route. I thought it was kind of late to announce new transatlantic service for this summer. Let's see what happens. By the way, gate A12 is now the 4th international swing gate--maybe a sign that another international carrier is on its way? RNE and dergon darkhelm like this. ​​​​There adding Minneapolis this summer. Lots of Irish in NE Ohio. There are rumors Aer Lingus is looking for major eastern US expansions, most likely tied to deliveries of new A321LR aircraft. It's unclear if those new A321LRs will be ready this year, though. Separately, the woeful INTL arrivals arrangement at CLE wouldn't matter for flights from DUB as they have US pre-clearance. When they deceided to build a new convention center downtown should have planned to then buy the IX Center as the site for a new terminal. The IX Center is MUCH bigger than the downtown convention center; it's profitable; it draws lots of out-of-town attendance; and nothing could replace it for the large industrial and consumer shows. I'm not sure that even a new air terminal could justify tearing it down. I also think that that lot may have logistical concerns like proximity to the runway safety area and difficult to orient all of the required services without encroaching (e.g. gates, parking, terminal infrastructure, etc.) -- best bet would likely be to reconfigure D to a more usable floorplan (it always felt awkward / not enough seating/circulation even when it was only used for express -- and of course the turboprop fingers would need to be demolished and rebuilt anyway), build ticket counter space on the end of it then rebuild C (and possibly B depending on gate counts) pushing the ticket counter and baggage claim further into the current terminal area to allow more space for landside circulation -- and then likely demolish A. This would allow some of the existing infrastructure to be repurposed and have minimal impact on supporting infrastructure (e.g. RTA red line, parking garage, approach roads, etc.) and likely substantially lower cost than a greenfield solution. Is the IX center even in the corporate limits of Cleveland or is it in Berea? I guess someone jumped the gun. Maybe CLE-DUB in 2020? If it happens, I'd prefer EI to FI, even though it's only one letter different. Of course, I'll have to act fast. Clevelanders will undoubtedly squander this opportunity to avoid the likes of ORD and EWR when Europe bound. Watch. CLEAR is coming to CLE: https://www.clearme.com/. Here are the three kiosks at the Central Checkpoint. There are also machines near the South Checkpoint. 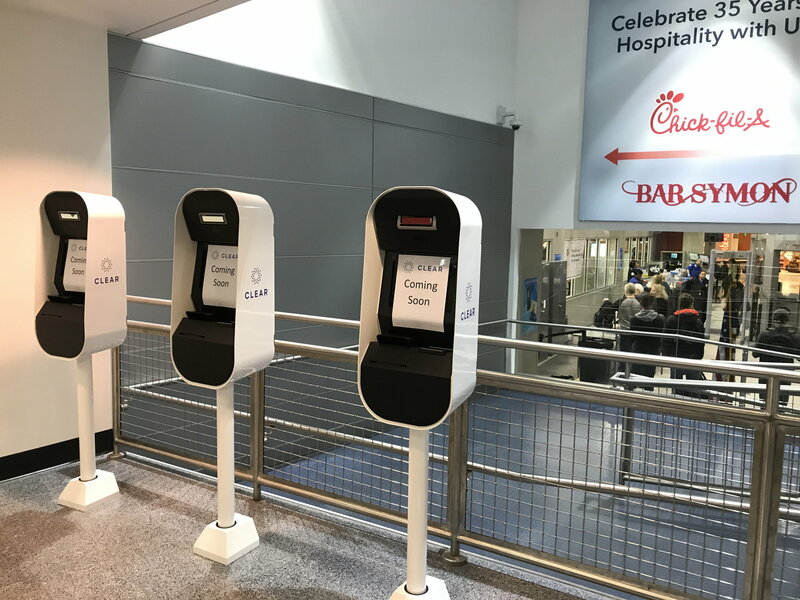 After checking in at the Clear kiosk, the Clear agent walks you directly up to the TSA agent's podium, so you don't have to wait in the Precheck line.